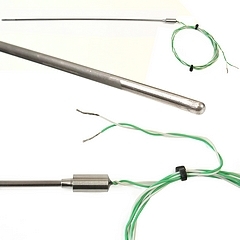 Each probe is supplied complete with plain pot seal and 1m twisted pair PFA insulated lead (bare tail ends without a plug). Type N are inconel 600 sheathed and type K & T are 25/20 stainless steel sheathed. Image representive of range. Shows Type K, 3mm dia, 250mm long.